Iodine deficiency is the world's single most significant preventable cause of brain damage and mental retardation. Iodine Deficiency Disorders (IDD) reflects broad manifestations of iodine deficiency, including implications on reproductive functions, human productivity, and country's development at large. Today IDD is a public health problem in 130 countries affecting 13% of the world population. In India, no state is free from iodine deficiency and 200 million people are 'at risk' of IDD. The simplest solution to prevent the IDD is to consume iodized common salt everyday. This review article chapter discusses the phases of the IDD control programme in India since 1962, its origin, beneficiaries, spectrum of activities (with special reference to Universal iodization of salt) and evaluation studies. Though there has been remarkable progress in implementation of IDD programme, the sustainability of the NIDDCP is critical for the elimination of IDD. For achieving sustainability i) there is a need of undertaking operational research and developing a MIS system for ensuring that iodized salt of good quality moves by the road transport. ii) There is need of undertaking IDD periodic surveys to assess the current magnitude of the problem of iodine deficiency and assess the impact of iodized salt intervention programme and iii) There is a need of strengthening ongoing health, nutrition education programmes on IDD for ensuring continued demand for iodized salt. This study was conducted to find out the frequency of clinical and subclinical hypothyroidism in pregnant women in our population, the prevalence of anti-TPO positivity in those with clinical and subclinical hypothyroidism and to compare obstetric and perinatal outcomes in these subgroups. Six hundred and fifty consecutive pregnant women were screened for hypothyroidism. Anti TPO antibody was tested in the hypothyroid women. They were followed up for pregnancy outcome separately. Incidence of hypothyroidism in pregnancy was 3.69%. 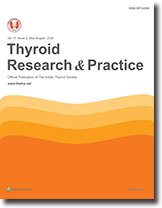 Incidence of clinical and subclinical hypothyroidism was 0.61% and 3.07% respectively. Five out of twenty four (20.8%) were TPO-antibody positive and rest nineteen women (79.2%) were TPO-antibody negative. Maternal complications like hypertension, pre-eclampsia, and GDM as well as fetal complications like abortion, IUGR were more common in antibody positive women. Pregnancy with hypothyroidism is associated with increased maternal antenatal and fetal complications, more so in those with positive TPOantibody. Hence besides screening with TSH, TPO antibody should be done in all cases if possible. A 19-year-old girl who presented with fever of unknown origin of 2 months duration was evaluated. She had a palpable axillary lymph node, mild hepatosplenomegaly and leucopenia (WBC count 1,500/cmm). She was assessed for systemic infection, haematological malignancies and autoimmune diseases. All the investigations for cause of leucopenia and fever were negative. Presence of goitre, past history of hyperthyroidism, clinical findings of tachycardia, tremors and weight loss with thyroid hormone profile suggestive of hyperthyroidism prompted us to think of thyrotoxicosis related autoimmune abnormalities leading to lymphadenopathy, hepatosplenomegaly and leucopenia. Patient improved in 3 days after starting anti-thyroid drugs. Thyrotropin-secreting pituitary tumors (TSHoma) are a rare cause of thyrotoxicosis and pituitary adenomas. Here we report a case of TSHoma treated with octriotide preoperatively. Patient showed quick restoration of euthyroidism with octreotide. Imaging showed significant reduction in the tumor size ten days after starting octreotide. Patient underwent trans-sphenoidal resection of tumor with restoration of vision.